Soil is a natural body composed of minerals, organic matter/humus, air, water and microbes. Although all humus is considered organic matter, all organic matter is not humus.The ratio of soil components varies according to location and practices. A general healthy balance for growing is considered to be 30-35% minerals, 15-20% organic matter & humus, 25% air and 25% water and an abundance of micro organisms, in excess of the weight of a cow per acre. Microbes are integrated with other soil components.The ratio may fluctuate according to the type of soil formation and the proportion of air and water and is affected by weather, time of day and season. Good compost should smell like a forest floor. 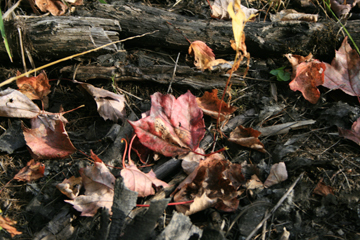 Image above shows a patch of forest floor at our forest research location. Forest soils are usually high in fungal matter and rich in microbial diversity. Minerals are transported and relocated through different media. Volcanoes distribute minerals through eruptions. Exposed mineral surfaces from these eruptions break down and are displaced from physical and chemical weathering such as freezing and thawing, heating and cooling, wetting and drying, grinding or rubbing, erosion, organisms, etc. Water is an effective means of transportation and is the main contributor involved in the levelling of mountains. During transition, stones are dissolved and carried along the water's course. Fast moving water deposits large stones and gravel, while slow moving water deposits silt and sand. Minerals are also transported by wind, ice and other glacial phenomena. Glaciers act as giant bulldozers gouging the earth, mixing rocks, sand, silt and clay and depositing them in different locations. Melting ice flows, carrying nutrient rich water into lakes, streams and the oceans. Although minerals are often depleted from soil through years of farming, harsh weather conditions and excessive use of chemicals they can be easily replenished through the application of mineral complexes and compost. Compost and mineral applications help the soils tilth and increase its ability to retain water. Paramagnetism can enhance the soil's fertility potential. Paramagnetism is a phenomena measured with a CGS (centimeter /grams per second) meter. Paramagnetic stones attract & repel soil particles increasing soil flocculation and respiration. When encouraged, the biomass has the capacity to function efficiently, collecting and storing energy from the Sun. Magnetism pulses on the infrared end of the spectrum and accentuates negative ionization within the soil. Root systems appear to be stimulated by paramagnetism. Bacteria and microbes depend on calcium and other minerals to motivate regeneration. The interaction of magnetism within the biomass causes electrical/chemical reactions enhancing capillary action. The frequency of lightning causes magnetic stimulation of certain minerals creating activity within the soil. In addition, lightning naturally contributes up to 50% of nitrogen fertilization in soil. Humus and mineral diversity also offer immense flexibility to the nitrogen cycle. Organisms flourish digesting minerals, providing a slow release of nitrogen, oxygen and other nutrients which cleanse the ecosystem. 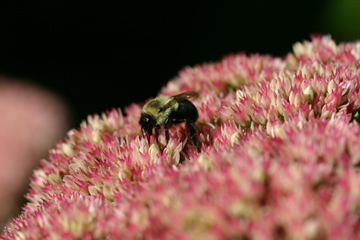 Bees are attracted to the natural enhanced aroma of flowers when compost and minerals are used. Amphoteric, Piezoelectric, Pyroelectric. These properties combined with magnetism power-up cells to catalyse production of negative ions, essential oils, amino acids, enzymes, alcohol, sugars and noble gases. Amphoteric complexes possess the unique characteristic of being able to react as an acid or a base. Piezoelectric crystals provide electrical stimuli when stressed under barometric pressure of heat, frost, or rain. Pyroelectric minerals, when stressed under heat, cooling or pressure, acquire an electrical charge stimulating the carbon cycle as they discharge. These dynamic components provide capacitance to literally light up the soil with bioluminescence. It is crucial to support soil with mineral diversity that possess properties which stimulate microorganisms. Present conventional approaches often overlook the importance of bio-diversity, creating an array of undesirable effects. Global Repair acknowledges that biological processes can depend upon the action and presence of mineral diversity. Our products provide the tools to enrich the soils ability to retain nutrients, absorb or release moisture and deter erosion. Although minerals and microbes are often depleted from soil through years of farming, harsh weather conditions and excessive use of chemicals they can be easily replenished through the application of mineral blends with aerobic compost. Mineral applications and compost help improve the soils tilth and ability to retain water. Biology is the key to unlocking these nutrients. Exposing these minerals to the biological process that takes place during aerobic composting makes them more readily available to the plant. Our specially formulated Compost Rock FlourTM can be added to compost and then applied to the land. See our Compost Rock FlourTM.